According to the election rules and the results of this voting, the proposal is hereby initiated. 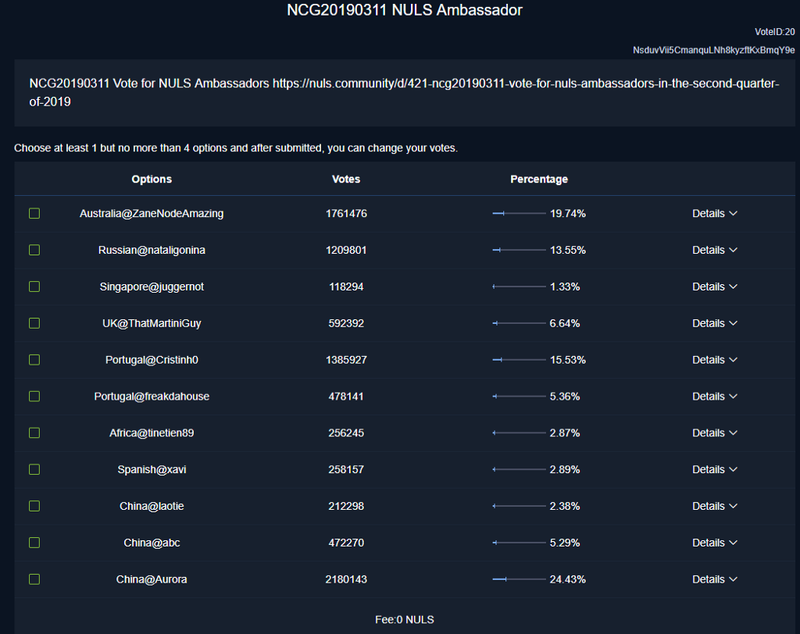 Please perform the entrustment according to the rules and officially execute it before April 1, 2019, and keep staking 200,000NULS for these ambassadors. The above ambassador members will be implemented from the second quarter. We once again thank all participating members of the campaign ambassador for their participation and contributions from all ambassadors in the first quarter. We hope that the members who are not elected in this ambassador campaign will continue to contribute and keep up with the good work to the community. Thanks to all of you! Expecting your performance in the next quarter’s ambassador’s campaign. And because of you, the NULS community is constantly growing and developing! If you have any other suggestions, please feel free to mention them on our forum! Join our social media and explore NULS!